LifePath Christian Ministries provides for the needs of the community in an environment where all can be loved, honored and served. Its staff and volunteers are the makers and creators of new beginnings for those in need of hope and a transformation for life. This holistic transformation is central to the organization’s mission and vision. The LifePath Christian Ministries Learning Center demonstrates how LifePath continues to evolve to meet the needs of individuals who need assistance with education, job training, life and conflict resolution skills to achieve a better quality of life. Chief Program Officer Steve Brubaker describes this vision. Q: What is the purpose of the Learning Center? A: The most obvious purpose is to improve the academic status and the employment capacity of the adult learner. Students will be challenged to meet a demand to learn something they might not have naturally pursued. They will learn to tolerate failure and achievement, get along with their fellow students and ask questions for understanding. Q: How will the Learning Center help people further their education or receive job skills training? A: The Learning Center provides individualized assessment and education planning. Software and instruction centers on academic review of basic skills, preparation for obtaining a GED or diploma, work to become computer literate and assistance with job searches and job acquisition. Q: How do you believe the Learning Center fills a need in the community? A: The unique aspect of the Learning Center is that it is housed in a homeless residential facility. This positioning gives support for a population that is often less used to expectations of regular and on-time attendance and accountability. 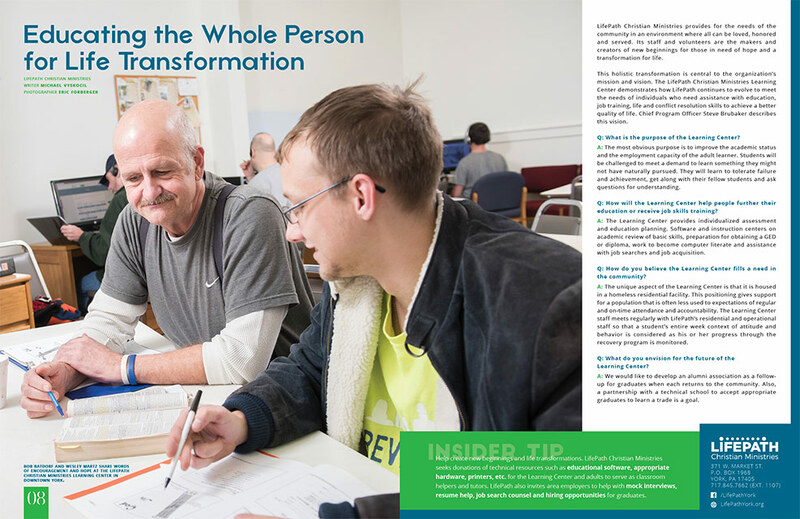 The Learning Center staff meets regularly with LifePath’s residential and operational staff so that a student’s entire week context of attitude and behavior is considered as his or her progress through the recovery program is monitored. Q: What do you envision for the future of the Learning Center? A: We would like to develop an alumni association as a follow-up for graduates when each returns to the community. Also, a partnership with a technical school to accept appropriate graduates to learn a trade is a goal. Help create new beginnings and life transformations. LifePath Christian Ministries seeks donations of technical resources such as educational software, appropriate hardware, printers, etc. for the Learning Center and adults to serve as classroom helpers and tutors. LifePath also invites area employers to help with mock interviews, resume help, job search counsel and hiring opportunities for graduates.